This week, I was interested to see @fietsprofessor tweet an image of Amsterdam in the 1970s; a road completely blocked by cars, all desperately trying to get across an intersection, resulting in total gridlock. The caption to it reads: ‘Go on, tell me again.. that your city is not Amsterdam’. I feel like this could be the catchphrase to my week. On Tuesday, I ended up having a lively ‘discussion’ about a headline in one of our local papers. The story was about a pilot ‘School Streets’ scheme, aiming to reduce congestion, improve road safety and encourage active travel. However, the counter argument is that some parents feel upset by the new proposals. They now need to build extra time in each morning to walk the last part of their journey or find an alternative means of getting to school, in what can already be a tight morning schedule. And alternatives aren’t that plentiful as ‘[Croydon] isn’t Copenhagen’. I agree entirely. I can’t actually think of anywhere in our borough that could boast of high-quality infrastructure, the kind that enables truly inclusive, 8-80 cycling, the kind shown in Rachel Aldred’s excellent new video, ‘Cycling for All‘. But Rachel’s video isn’t about Amsterdam or Copenhagen; the cyclists she speaks to are in the UK. So right now, it’s not that Croydon isn’t Copenhagen, the problem is that it’s not even Cambridge, nowhere near, and even more upsetting, that perhaps we don’t even imagine that we could one day be a town that people ride around because of the infrastructure, not despite it. And right now, our infrastructure is a real barrier. 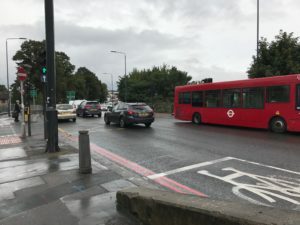 A few days later I joined Caroline Russell, the London Assembly Member for the Green Party, on a Fiveways ‘Walk Round’ as part of her outer London junctions project. The tour was led by TfL’s senior programme sponsor, Thomas Holmes, whose team is responsible for the proposed junction design. Our group was pretty diverse, with Transport for All, Living Streets and local residents (in the form of ward councillors Andrew Pelling and Robert Canning) all represented. The discussion was… lively, but given this is the first time a redesign of the junction has been proposed since the 1980s, it’s hard not to see it as a once in generation opportunity to start talking about the kind of town we want Croydon to be over the coming years. However, what I learned during the tour, is that the redesign isn’t really about Croydon’s community. 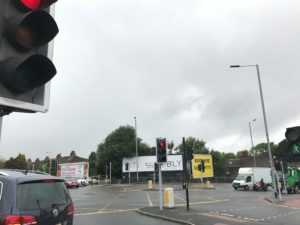 It’s about keeping the traffic moving and as Austen said last week, it’s about ensuring people can get into central Croydon and the (potential) new Westfield shopping centre easily. And the reason car traffic is prioritised is, I was told, that this is outer London and car culture is so embedded, it has become permanent. I find it impossible to quite articulate how upset this makes me, because then it does seem ridiculous that Croydon Council are trying to create healthy school streets. 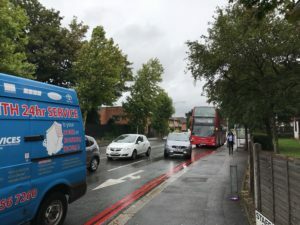 The closures alone will not reduce the congestion cause by school run traffic, they need to come alongside other measures that will give parents a proper choice about how they get their children to school, like proper protected cycleways or investment in public transport. Neither or which are part of the plans for Fiveways, which is a joint scheme with Croydon Council. The crucial point to make about the Fiveways site is there is a new primary school, just a few hundred metres from the junction. At present, it is only partially open, but in five years time 650 pupils will be travelling to and from that school each day. Equally, the land at the bottom of Duppas Hill Road is earmarked for educational use; a secondary school is possible in the future. 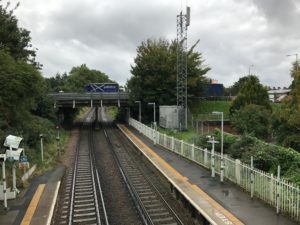 Caroline Russell at one point questioned why no pedestrian crossing was to be installed at the point linking a bus stop and supermarket to the housing opposite. If you had heavy bags, why would you wait to cross four separate sets of lights? Wouldn’t you just try to dash across during a break in the traffic? We could take this a step further and ask; won’t some of these local school children do just that? It seems that teen brains are designed for risk taking and primary age children find it difficult to recognise how fast oncoming traffic is travelling towards them. Therefore, this proposed design isn’t just disappointing, it’s potentially lethal. Five years ago, when I first started teaching, a fellow new teacher told me that she was leaving her school to work in Dubai. The reason was that her entire school community had been traumatised by an absolutely horrendous event and she needed to get away. A little boy had let go off his mother’s hand on his way home from school. He stepped out and was killed by a HGV. He was five. Since then, St George’s road has been redesigned to try to make it safer for pedestrians and cyclists. But it shouldn’t take something so awful to bring about that change. So please, let us get Fiveways right now and TfL, please, please see that fast moving, free flowing traffic isn’t actually a worthy ambition for Croydon or for its young people. Just because our city ‘isn’t Amsterdam’, doesn’t mean we don’t want it to be, one day.